Be sure to check back often for the latest promotions and shop our Deal of the Day for special one day pricing! 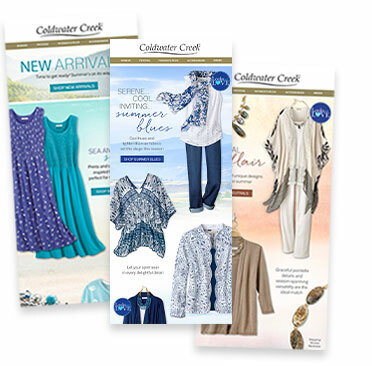 Make the decision to treat yourself a little easier with multiple ways to save on all your favorite styles from Coldwater Creek. Find fantastic deals year-round by shopping our Sale. You’ll find markdowns and reductions on a wide selection of Women’s Plus Size, Petite, and Misses styles. For even greater savings, shop our Outlet. You’ll discover great prices on everything from tops, shoes, and jewelry and you won’t even need a promo code. These styles won’t be around for long though, so if you find something you like, buy it now! Save even more by becoming a subscriber to our email list and we’ll send you a coupon worth 20% off your next order. You can even apply for a Coldwater Creek credit card to earn another 20% off promo code once you’ve been approved. At Coldwater Creek, there are so many great ways to save on the clothes you love. Be sure to check back often for the latest promotions and shop our Deal of the Day for special one day pricing! 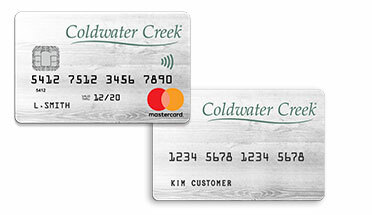 The Coldwater Creek Credit Card is issued by Comenity Bank. The Coldwater Creek Mastercard® is issued by Comenity Bank, pursuant to a license by Mastercard International Incorporated. Mastercard and the Mastercard Brand Mark are registered trademarks of Mastercard International Incorporated. ⁎Subject to credit approval. Notification of approval will contain a 20% Savings code valid towards your first Coldwater Creek purchase (excluding tax/shipping fees) made with your new Coldwater Creek credit card. Not valid on prior purchases.